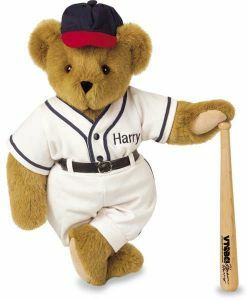 When I was a little boy I was given a teddy bear and named him Shortstop. He was floppy, fluffy, and could hit the ball from both sides of the plate. He wore a short vest on which I crayoned his number. Shortstop the Bear is sitting nearby as I write this, and the yellow scrawl on his back is still visible, though not decipherable. I had not yet discovered penmanship. Soon after Shortstop joined my team I recruited a talented prospect from an older cousin: a flexible plastic Mickey Mouse. Nickname: Mr. Mouse. Mr. Mouse, unfortunately, is no longer with us. His blossoming career was curtailed in a horrible highway accident. Mr. Mouse has not graced an infield with his goofy smile and charcoal nose in many years, but for as long as baseball is played, his name will live on. Our ballpark was conveniently located in the backyard, and our diamond constructed of traditional backyard materials. Home plate was a rock. First base was a rhododendron. The rhododendron also served as first baseman. Second base was a sweater; third base was another rock or a pillow smuggled out of the house. In traditional backyard fashion, my diamond looked less like a square and more like the orbit of Pluto. Shortstop the Bear had exceptional skill afield; he played almost every position, and without a glove! I still recall the afternoon we played the Yankees, when Shortstop made so many outs on one play that the Yanks couldn’t come to bat for three innings. He was equally adept at the plate, delivering hits when they counted most, never striking out with a mouse on base. Mr. Mouse was my catcher, because he was tall and made a good target. He was highly esteemed around the backyard for his ability to handle his pitchers. He squeaked in a friendly way when squeezed; this added to the excitement when he was hit by a pitch. As the pitcher, it was my job to throw the ball past the befuddled batter, which, under our rules, was an out. Should an errant pitch strike Mr. Mouse, we considered it a hit, and the batter was welcome to try his luck on the bases. Thanks to Shortstop’s fielding prowess, most runners never reached the safety of the rhododendron. As our leading slugger, it was up to me to hit the homeruns. This I did, every time I came to bat. Fortunately for the morale of the opposition, my grasp of arithmetic was not equal to the task of keeping score, or each game would have seen us 200 runs ahead by lunchtime. Fine players though we were, we were not prepared for the woman nor the events that spelled the end for backyard baseball. Trudy, the infant daughter of my mother’s best friend, was like one of those celestial objects sent at intervals to confound the faithful. Her chief accomplishments were sitting up and making a mess. Social conformity was not her style; Trudy went her own way in all things, chewing her Crayolas in public and drooling as if she had a quota to fill. Twice a week Trudy’s playpen was set up in right field and filled with Trudy and her dolls, stuffed animals, building blocks, crayons, and coloring books. We ballplayers had to devise rules to govern this unwelcome intrusion. Anything hit by the opposition into the playpen was an out. If it hit Trudy it was a double play. If the ball hit Trudy and she cried, I had to climb inside the playpen and color with her until she was happy again. Sitting inside the chaos of her playpen was embarrassing, and Trudy’s artistic techniques were primitive and boring. Coloring inside the lines defeated her. Not wanting to expose herself to ridicule, she routinely colored the entire page with one color and then peeled the paper off the crayon. Anything hit by myself or my teammates into the playpen was a homerun. If it hit Trudy, it was two homeruns. Implementing these procedures consumed valuable playing time. Big league backyard baseball was stalled twice weekly by one woman and her playpen. But as an impetuous, confident young man I felt certain I would eventually triumph over women in general and Trudy in particular. One afternoon, a wooden block inscribed with the letter A, a chicken, a horse, and the number 3 conked Shortstop on the head. As I helped him to his feet, a K, a goose, another horse, and an 8 bounced off my foot. Trudy, having finished her bottle, was bombarding us with her blocks. I collected her ammunition and, in a gesture meant to illustrate the concept of mutual assured destruction, dropped everything on the head of her favorite doll. Instead of acknowledging my superior reasoning, Trudy pushed a pile of blocks through the bars into right field. She wanted to play with me; lacking the capacity to hold me in conversation, she hoped to engage me in my preferred pastime. So long as I returned every block so she could throw them again, we were playing. I pondered this situation while Trudy continued her game. Considering that her throws had all come from a sitting position, she was doing impressively well. This gave me an idea: relief pitching! Trudy’s playpen was instantly the bullpen. I entered and picked up our new relief ace. Trudy was ecstatic at being released and given a ride, and I had to pull her arms from around my neck before I could set her up on the mound. I gave her the ball and explained the duties and responsibilities pertaining to pitching. Trudy listened attentively, then tried to swallow the ball. I explained the rule prohibiting the lubrication of the baseball while I pried it loose. I pointed home. Trudy drooled, hiccupped, and threw. The pitch struck Mr. Mouse in the abdomen. A hit! The batter raced for the rhododendron. I ran home, recovered the ball--and turned to find Shortstop trapped in the arms of our pitcher! She would not give him up! Disdaining diplomacy, I resorted to no-holds-barred tickling. Shortstop was soon free, but when I stopped tickling Trudy she started crying. She was a woman bereft of her bear; no amount of coloring could pacify her now. Her pudgy hands and fingers waved futilely at the frightened teddy bear I held away from her. I capitulated. “Just for a little while,” I said, and surrendered my bear. Trudy hugged Shortstop in an embrace that would have strangled an ordinary infielder, while I watched, helplessly. Like all members of her generation, Trudy was eventually taken indoors for a nap. It was then a simple matter to rescue my teammate. But on her next incursion Trudy made it known, despite her inability to speak any language native to our planet, that she wanted that bear. My mother was called upon to arbitrate. The commissioner’s succinct ruling: “You’re too old to be playing with a teddy bear!” Shortstop joined the paraphernalia in Trudy’s playpen. Despondent, I abandoned baseball. It was at this time that Mr. Mouse met his fate in the form of a Goodyear Radial. I had thoughtlessly left him on our driveway and he was run over by the milkman. My catcher was not the colossus I believed him to be. Though he easily withstood a barrage of baseballs, the weight of the truck from the Sunny Days Dairy was too much for him. The years echo with the agonized squeak bludgeoned from my friend’s flattened body by the man intent on delivering our gallon of regular milk and quart of skim. I was so distraught that my parents had to change dairies. Eventually I started school and found real catchers and shortstops to play with. Trudy developed other interests besides abducting ballplayers. Shortstop was relegated to the obscurity of her family’s attic. It was there that she found him, years later, and contacted me regarding his return. I was then in possession of my first apartment, and a furry veteran of baseball’s Golden Age, his uniform defaced by a yellow crayon, seemed just the thing to complete the décor. No doubt Trudy calculated that in returning my bear she was gaining my favor, but she was mistaken. A wound is a wound. Shortstop now spends his days sitting beside my computer. We don’t play ball anymore; the athletic prime of a teddy bear is far shorter than that of a human being. The knees go first. Is this what accounts for professional baseball’s shameful slighting of teddy bears? Although numerous human beings have been inducted into the Baseball Hall of Fame, not one stuffed bear has been so honored. The circumstances breed suspicion. One thing is certain. Shortstop will not disappear into the twilight zone of retired athletes, a topic for debate among fans: “Whatever became of Shortstop the Bear? Where is he now?” I know where he is now. He’s with me. Steven Bryan Bieler has had stories published in the anthologies American Fiction 3, Full Spectrum 1, New Dimensions 11, and in some places that don't have numbers, including Asimov's and The Seattle Review.